I can't believe I haven't shared this recipe with you yet! It is the most requested recipe I make, I know it by heart and usually jot it down on the spot when asked. Most people ask, "Is this the recipe on the back of the bag?" 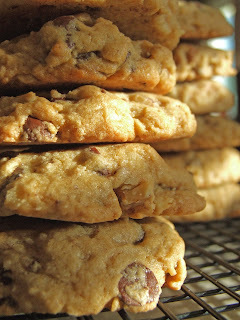 Sort of... let's just say over the years I have taken liberties with oven temperature, amount of sugar, flour and the creaming process.... so I have pretty much tweaked this recipe to produce a soft, perfectly textured chocolate chip cookie! Preheat your oven to 325 degrees F and prepare 3 jelly roll pans (1/4 sheet pans) with parchment paper. Cream together margarine, butter, and sugars until just barely mixed together, small visible lumps of the butter/margarine is OK. Add vanilla extract and cream for just 30 seconds more. Yes, weigh the flour, it's the only way to get perfect cookies. If you can't weigh the flour, measure out 3 & 3/4 cups. Add the dry mix to the wet and mix until just combined. Measure out dough onto prepared cookie sheets with a 2 tblsp scoop. Make 4 rows of 3 cookies each. Flatten slightly. Bake for 7 minutes and turn your pans front to back, top to bottom to prevent uneven baking. If you have a perfect or convection oven skip this step! Bake for 7 more minutes. Remove from oven, they should look slightly under done. Let cookies cool on pan.